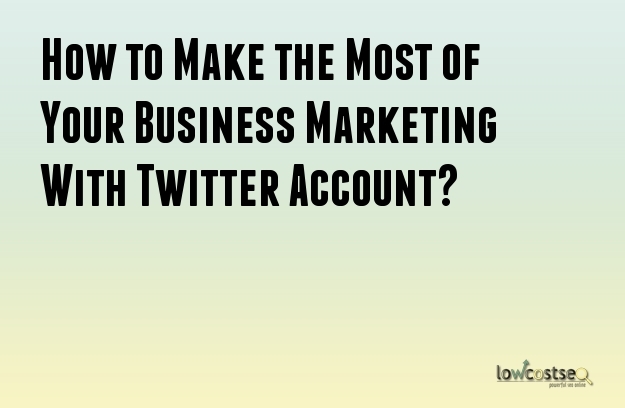 How to Make the Most of Your Business Marketing With Twitter Account? Are you a young entrepreneur? Are you looking for an opportunity for getting your business global? Well, you can certain if you use traditional marketing tools then your business will certainly not global quickly. You will have to make use of the most innovative marketing tools that are available in the market. Well, are you aware of them? Well, for using those tools you will certainly have to make use of the Internet. Yes, almost every business that you see nowadays is making use of the virtual platform. The Internet is one such place where you can certainly reach out to customers who are not only within your national territory but also across international borders. However, there are many online marketing tools that you can make use of like, search engine optimization, social networking platforms. Yes, by far the most powerful tool that any entrepreneur can make use of is the social media marketing platform. There are many social networking platforms like facebook, twitter, Instagram, and also LinkedIn. Each and every social network that you see here can be used for fulfilling marketing strategies. However, today you will get know how you can make use of twitter for promoting your business, product, services, and also your innovative idea. The first thing that you will have to pay attention to is the twitter profile that you create. Yes, this is, in fact, the most important thing that you all need to focus on when you are thinking advertising your business through twitter. You will need to click and upload the right profile picture which will not only make you look smart and attractive but also very much professional. You will certainly have to mention as to where your business is situated. You will have to give the right address so that people can find you easily and without any hassle. You need to also mention the URL to your website. Also do give a brief description about your business. This will give your followers some idea about your business and your objective. The best way to increase your viewership is by simply adding some attractive pictures that you feel will draw that attention. Make sure the pictures and images are related to the products and services that your business is dealing in. you can also attach videos other than the pictures. For a better quality picture do have the image size of 1024x512 pixels. In your twitter profile make sure that you include some hashtags. Yes, you can talk about all the important and relevant points that you think does concern your business. Make sure that you do leave some characters for retweets. This will actually give the opportunity to add comments. If you are looking to add a link makes sure that it is in the middle of the tweet that you are looking to write. Always make it a habit of tweeting at least 5 times a day. This will help you to stay connected with your followers for the majority of the times.